Jane M. Kurtz, 94, of Lancaster, passed away on February 12, 2018 in the Glen at Willow Valley Communities. She was the loving wife of the late Dr. John P. Slovak who preceded her in death in 1996 and to whom she was married for 53 years. She later married the late Judge John M. Kurtz, Jr. who passed away in 2006. Born in Kansas City, MO, Jane was the daughter of the late Frank and Mary Louise (Jacobs) McGuire. Her sister Sally resided in Kansas City until she passed away at 102 years of age in January 2018. A brother Frankie died as a child. After graduating from high school, Jane dedicated her life to her family as a homemaker, or as the family refers to her, a “Domestic Goddess.” Jane was an accomplished seamstress as well as a pianist. 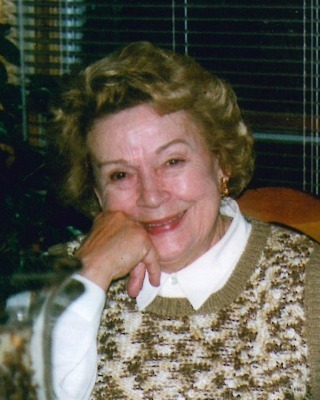 She also enjoyed gardening, cooking, golfing, entertaining, working for the United Way and spending time with her family. She was an extraordinary mother. She was a member of the Weatherley Flower Club prior to relocating to Lancaster, and First Presbyterian Church in Lancaster with her late husband Jack. She is survived by her children, Janine P. Pendyck (wife of Paul), Dr. John P. Slovak, Jr. (husband of Roxanne) and Joyce P. Stevens. Also surviving are thirteen grandchildren and eleven great grandchildren. She was predeceased by her eldest son, Dr. James Slovak in March 2017. My deepest sympathy and condolences to the family. So very sorry for your loss. She was such a special person. Sending prayers for all. I am deeply sorry for your loss of Jane. May you find comfort in the many precious memories you shared with her as well as the promise from our Heavenly Father to restore those that have fallen asleep in death, to perfect life on a paradise earth. As you contemplate,ate that promise, draw close to God in prayer and he will draw close to you and give you the strength you need to carry you through the difficult days ahead. All the best wishes for your family at this time, take care of each other. Expressing my sympathy to the families of Jane. She was an elegant lady. Met her and the Judge for the first time in 2005. Fond memories of that time together. Condolences to family, a wonderful and classy lady who brought joy into the lives of everyone who she met. A great friend to my Mom and Dad. I will always remember her as one of the kindest soft spoken lady’s I know. Rest In Peace . My heart goes out to you upon the loss of your mother. I hope that the passage of time may assuage your grief. All of the Andersens offer our deepest sympathies. So sorry for your loss may God be with you in this time of grief. My deepest sympathies on the loss of a great lady and dear friend! She was my best golfing buddy. We knew your mother as our Aunt Jane. She married our Uncle John and as we grew to know her, loved her. Jane was always a pleasure to be around and was a great addition to our family. May God rest her soul and may good memories sustain all of you in the days ahead.